If you’ve been following this series, watching the videos over at CitationLabs.com or reading the ‘people stories’ we’ve shared from top media such as the BBC, NYTimes and WSJ, you might be thinking, yes those stories are great. And hopefully, you can’t wait to create the same type of stories for your own business or your clients. So you jump in with enthusiasm, but after a few attempts, you’re feeling a bit disappointed. So maybe you go back to the examples we’ve given and you start doubting that you can ever write such great material. 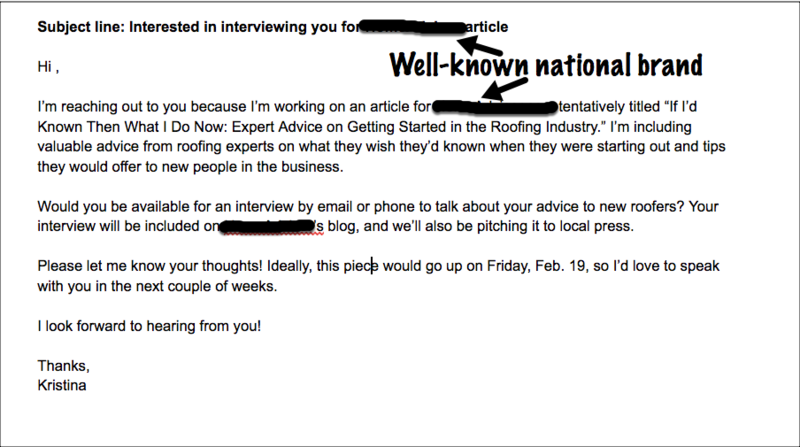 …perhaps you think that only an experienced journalist can get people open up in the way that makes interesting copy. Or you think, “if only I could find such interesting people to Interview”. These are questions all content writers struggle with. Yes, there are great stories within your grasp and everyone does have a story to tell. But you can’t just ask people to give you their best, ready-made stories. Instead, good stories – like good links – have to be earned. You ‘earn’ stories by having the patience to interview, listen and encourage. You need to help people trust you before they’ll feel comfortable talking to you. And interviews are real conversations – often people won’t even know their own stories – they discover their stories by talking to you. It’s a new experience for them too, and many will reflect on the interview by saying, “I never quite saw it like that before”. Interview people well and you’ll help them discover their own stories. I’ve been working with stories for over 30 years but I was still blown away by a fantastic collection of stories and photographs I got as a birthday gift last Saturday. ‘Humans of New York Stories’ started out purely as a photography book. And then Stanton had the bright idea of adding stories from the people he was photographing and the result was quite stunning. I used one of his quotes as the opening to this article. 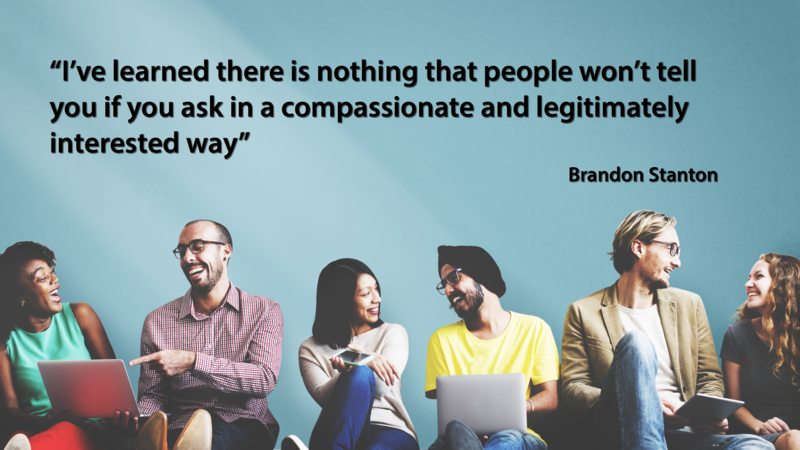 “I’ve learned there is nothing that people won’t tell you if you ask in a compassionate and legitimately interested way”. Over my career, I’ve interviewed many ordinary people and if you think that might be dull and boring, you couldn’t be more wrong! Indeed, it’s refreshing not to churn out quotes from the same experts as everybody else. Ordinary people who work for, buy products or use products in any industry are fantastic subjects to interview – and they’ll often give you unique, compelling material. 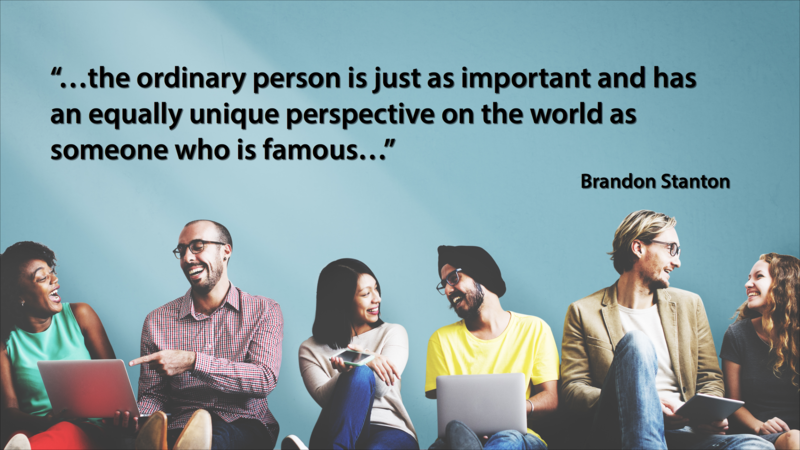 Last time, we gave you 4 sources of people stories – the founders, the staff, influencers, and customers. Probably, the most plentiful are customers – and they’re a great place to start. But one important caveat – an interview for story content is very different to a survey interview. Survey research might require you to ask 15-20 questions in a session – but that kills conversation dead! For story interviews, you should have about five topics you want to cover. Ask open questions that people can’t reply ‘yes’ or ‘no’ to – and be prepared to dig into topics that your interviewee seems really keen on. Let them lead you to where the real story is. Once you’ve decided who you need to interview (from 4 sources of great stories), you’ve then got to interview them in such a way as to get great stories. Remember you could just ask loads of questions and get a lot of material – but that won’t guarantee you’ll get good stories. You have to carefully plan and conduct your interviews in order to get the types of stories you’ll need. Here are Kristina’s top tips for planning interviews. (i) Identify the groups you need to approach AND the topics you’re going to talk about. You won’t ask the same questions of every group – make sure your questions are relevant to each group you approach. If you’re too fuzzy at this stage, you’re going to waste time and money so planning to get it right is essential. (ii) Set aside time to do the interviews. Just deciding to do an interview any time will probably make a mess of your own schedule. Much better to block out say, 3-4 mornings, afternoons or evenings and fit all your interviews into those blocks. (iii) Decide how you’re going to collect people’s answers – are you going to record or take notes? Doing both is probably the best option – and if you do record the conversation, you must ask permission. Ask something like, “do you mind if I record the conversation just to help my memory?” Don’t wait to review your notes after an interview – the longer you wait, the more detail and emotion you will forget. So build in time to review your notes directly after that call. (iv) Have a good idea of the type of content you’re going to create. Are you looking for in-depth personal stories or will you be creating posts that contain multiple interviews? So once you’ve done your planning, it’s time to make the initial approach. You can’t just say “I’m looking for people to interview”, that’s too much about you, not something that will persuade someone to give up their valuable time to talk to you. Much better to say, “We’re looking for people to share their experiences” – people love to talk about themselves. Your first aim is to get a telephone interview – email interviews rarely give you the quality of detail and stories you need – you’ve got to talk directly to people for that. Set up the interviews for specific times. “I’ll call you on Monday afternoon” is not good enough. “I’ll call you on Monday afternoon at 3:30 pm and we’ll talk for between 20 to 30 minutes” will allow people to put the right time aside and means you’ll have less ‘no-shows’. Remember that people are busy and you’ve got to be accommodating and interview people when they’re available – not just when you’d like them to be! Nearly always, you’ll want to do just one interview with people so you must get it right the first time. Make sure you’re not under time pressure and get yourself into the right frame of mind. Going over your questions before you pick up the phone is a must. You might find that visualizing successful interviews you’ve done in the past might help. Be bright, confident and positive right from the start. Remind them who you are and what you want. Give the interviewee freedom to talk – but keep the focus on what you need to get – good stories for your content, even if what you get is a little surprising. Listen out for usable quotes and take good notes. Don’t be afraid to ask people to repeat what they said if you didn’t quite take it in. One interview is what you ideally want, but if you do need more information or want to explore an issue further, don’t be afraid to ask. An interviewee can be significantly longer or shorter than what you budgeted for, so you’ll need to respond accordingly. If it’s shorter than you expect, be polite, thank the interviewee for their time and end the call. If it’s longer than you expect and a good interview, do everything you can to keep going – otherwise you might lose something fantastic. Instead, reschedule your next call if you can. Despite your best efforts in “qualifying” an interviewee and during your conversation with him or her, sometimes you don’t get anything usable. If that’s the case, don’t try to force content out of a bad interview – it just won’t be good enough. So just cut your losses and move on! You can read all the advice you like, and you can scan stories in high-quality media, but the best way you can learn to use people stories as compelling content is to get started. We’ve told you that the best place to start is with your customers. So what are you waiting for? Get started and please tell us how you get on – hey, we may even feature your work in a future post!